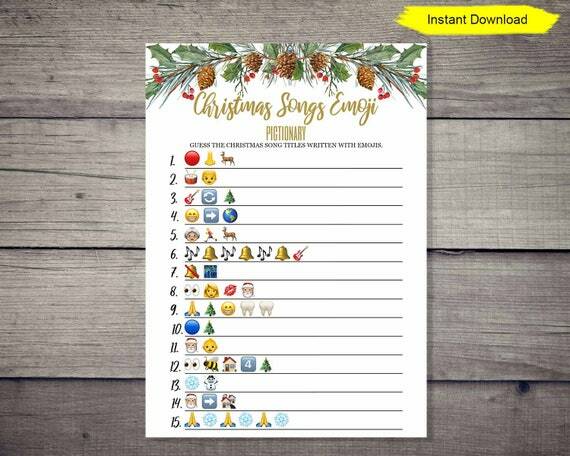 Have fun and entertain your guests at your Christmas Party, Bridal Shower, Baby shower, Classroom party playing the Christmas Songs Emoji Pictionary game with a wintergreen, pine cone, and holly berry design. This listing is for an INSTANT DOWNLOAD of a single PDF file of the Emoji Pictionary Game. Two 5x7 Bride Cards fit on a single 8.5 x 11" sheet of paper. Also, included is the 5x7 JPG file of the card and the 5x7 JPG file of the answers. To open the file, you will need the current version of Adobe Reader. You can get a free download of Adobe Reader at adobe.com. No refunds on digital files. This file is for PERSONAL USE only. You can NOT sell-share-copy or re-distribute this item. However, if you have an issue or question, please let me know. Please note that the colors displayed on the images may differ from the colors printed on your printer, depending on the quality of printer and the level of ink remaining in the printer. Additionally, several of the PDFs contain images across the entire 8.5x11" paper. Please check the correct setting for the printer to print the entire image for best results. The PDF image may also be made smaller to reflect your printers margins. To do this choose File->Print and select the Scale option to scale the image to 98% or the percentage that is best. This product is created and sold by Create IT Consulting, LLC. Our Emoji Pictionary Game is less expensive than compared to purchasing physical party games in a party store.